One of the downsides to having an enormous T-Day at your place is the weird left over stuff. We don't have enough Turkey to make a single sandwich but there are four half-full quarts of heavy cream in the fridge just waiting to go bad. What to do? Recycle into what? A plot point for a clever but ultimately unrewarding cable sit-com? What is crème fraîche exactly? It's essentially yogurt but made with heavy cream instead of whole milk. The point of it is that the bacterial cultures that you add to it eat the lactose and poop out acidity thus making the cream more durable and flavorful. Not to mention thick and luxurious looking. Check GG Yogurt Cliffhanger for more on the particular geeky elements of cultured milk. Christ even this post is basically a recycled version of an earlier and better artifact. I'm going to go sit in the bath tub and cry for a while. Luckily, making crème fraîche is much easier than living with the fact that we're living through the end of history. 1 Quart or so heavy cream or half and half or whole milk or whatever you have hanging around that isn't bad yet. Mix them together. It'll be fine. You'll also need 1/4 cup of LIVE CULTURE yogurt. Fancy pro-biotic stuff or the grungy greenmarket stuff will do fine. Now take your thoroughly washed big sized Ball jar and put in the cream. Not too full! Next place it in the pot with water and bring the water up to the boil. 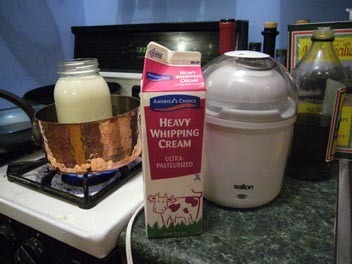 This will gently heat your cream to near the boiling point. Once the cream has gotten to at least 140' remove it from the water bath and set in the fridge to cool to around 100'. Now take your yogurt and mix in with a cup or so of the warm cream until it isn't lumpy anymore. This could take a while. Mix this solution in with the rest of the cream and place in your yogurt maker or a 110' degree oven over night (please cover theopening to the jar in the oven so it won't smell like last weeks fish disaster). 8-10 hours should do it. The longer you go the more tart and acidic it will become as the bacterial cultures will have longer to work. The next morning simply remove from the oven or yogurt maker and place in the fridge. Now you can use this glorious, gloppy goodness for serving with some of that fancy citrus that is showing up these days or even to make a the best blue cheese dressing in the whole world.